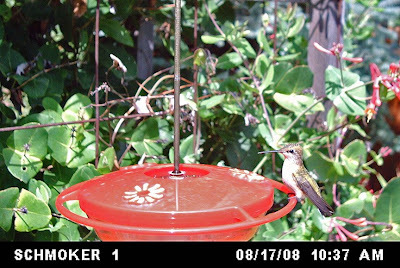 My yard has had the expected push of female/immature-type hummingbirds for the last few weeks, so I decided to deploy my Wingscapes BirdCam in attempt to remotely capture images of the birds. It is nice getting bird photos even when I'm off teaching, birding somewhere else, or sleeping in! 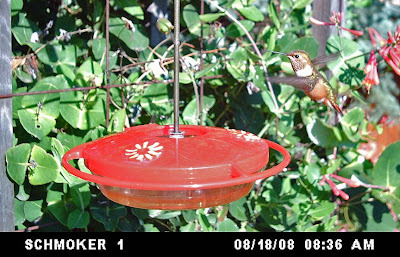 Next up is an immature male Rufous Hummingbird. Here we see extensive rufous throughout the basal half of the tail, spilling into some of the uppertail coverts. How do we rule out Allen's? Well, for one I'm in Colorado, where that species has yet to be documented. I expect Allen's to turn up in the state, however, and it is going to be a photo like this that proves it. 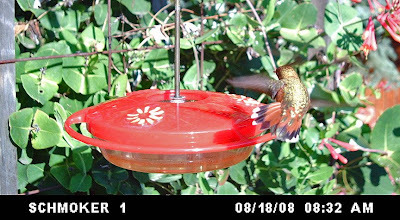 Perhaps a hummingbird bander will get the shot, but I wouldn't rule out digital photography of freely flying birds like this. You can see the strongly notched tip to R2 (the second tail feather out from the middle), diagnostic for male Rufous. 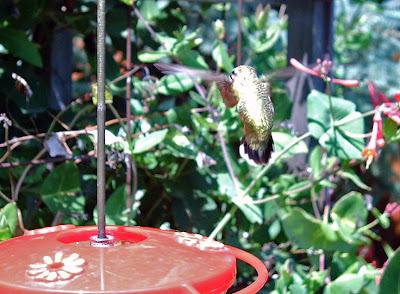 Additionally, R4 & R5 (the outermost tail feathers) would be even narrower than these in male Allen's. 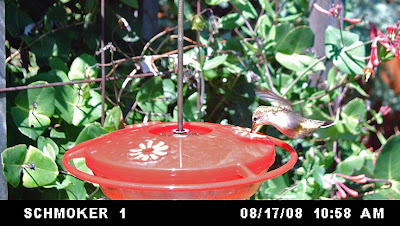 Beyond the tail pattern, notice the overall chunky look of the bird, bull-necked and with a fairly short, straight bill (giving a much more compact appearance than the Broad-tailed.) A nice rufous wash on the flanks and white forecollar also mark the immature male Rufous. 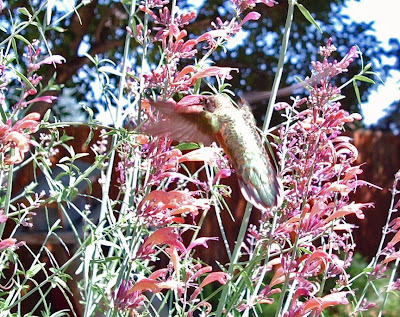 Beyond that, this diminutive hummer has a short straight bill and a funny pot-bellied look. I think they are shaped kind of like a bowling pin. 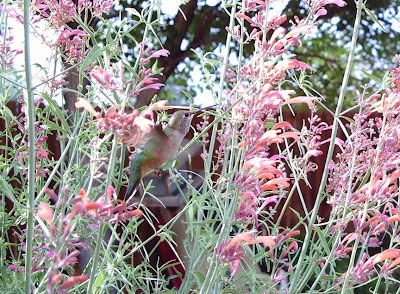 Also, note it isn't nearly as warmly colored on the flanks as either of the preceding birds. My dad & I took a swing to Jumbo Reservoir in NE Colorado on the auspicious date of 8/8/08, hoping for a serious hit of shorebirding. 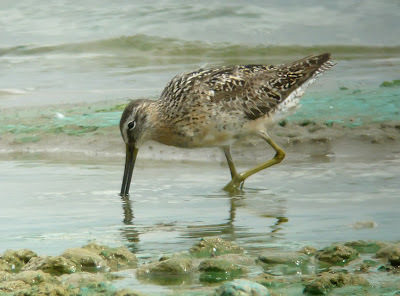 Shoreline conditions were pretty good, and the numbers and diversity of shorebirds were good, too. I always like re-tuning on peeps, and we had decent looks at Colorado's common little guys (Least, Semi-palmated, and Western Sandpipers) to calibrate on. Baird's Sandpipers were spread around about every section of shoreline, offering a good size standard to compare numerous other species to. A smattering of larger shorebirds like Willets, Marbled Godwits, and both Yellowlegs upped the interest level, as did a small group of 15 or so dowitchers. Soon after we stopped to examine them more closely my dad mentioned a bird that had the makings of a potential Short-billed Dowitcher (pretty unusual in Colorado.) Juveniles are pretty straightforward, but this was an adult. 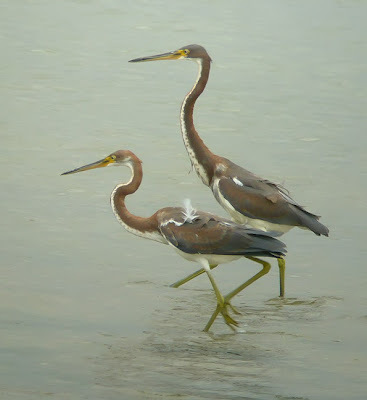 Marks that he noticed and that I liked, too began with the overall feel of the bird- slightly smaller looking, paler below, and flatter-backed & less rotund than nearby Long-billed Dowitchers when it was feeding. Perhaps it was coincidental, but the bird never mixed into the main group of Long-billed Dowitchers, instead keeping off to itself at the outskirts of the group. I moved in for a bout of digiscoping, keeping enough distance between myself and the dowitchers on the open shore to avoid flushing or disturbing them. Getting home, I liked what I saw for SBDO and some birding pro friends of mine agreed. 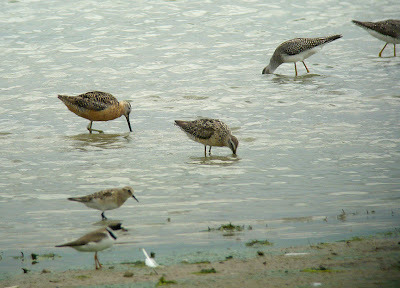 Short-Billed (left) & Long-billed (right) Dowitchers, plus a Baird's Sandpiper in the foreground. 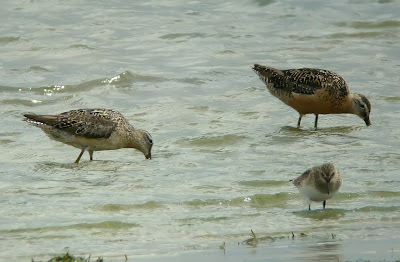 5 shorebird species- can you ID them all? Anyway, after working on the Dowitchers I began scanning farther down into the SW corner of the lake to see if I could pick out any other good shorebird concentrations. 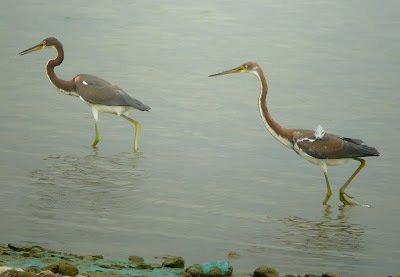 A pod of plegadis ibis was cool, and there were Black Terns and Franklin's Gulls about everywhere in droves. 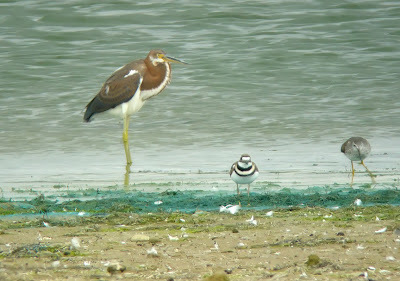 Then something really odd-looking popped its head up from behind the loafing gulls- a Tricolored Heron! That was a new state bird for me- I ran back to get my dad & we enjoyed our views despite some bad air distortion, and I got some digiscoped record shots: The bird eventually came walking by directly in front of us while we were eating our lunch, offering great views of its juvenal plumage before flying across the bay. I was a little bummed for some friends of mine who were driving up to see it, but at least it wasn't gone- just far across the lake. 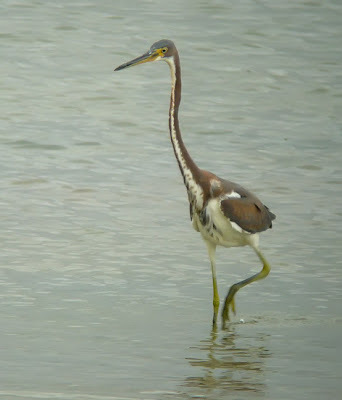 I then turned my attention back to the ibis I had spotted earlier in the corner of the lake, and dang if there wasn't a Tricolored Heron on the shoreline near them. I figured that it had somehow flown back over without me noticing, but I had a funny hunch that I should have noticed that so I looked back across the lake and sure enough, that Trike was still there. Shazam- two Tricoloreds in one spot!! That's the only time this has happened in Colorado as far as I can tell. The second bird was darker, and I initially thought it was an adult. 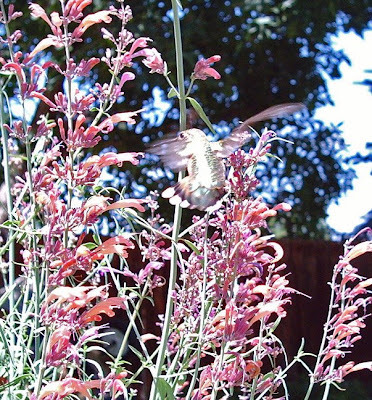 But now, looking at the pictures, I think it is also an immature bird. 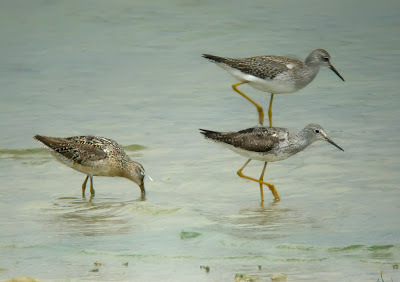 I don't know if these have a 2nd-year plumage or if juvs are variable- any comments on the 2nd bird's age? To cap it off, the redder bird flew back to our side of the lake and the two birds foraged together, working their way down the shoreline right in front of us. I shot some frames of the birds together and got a video clip showing them with a pair of Snowy Egrets. 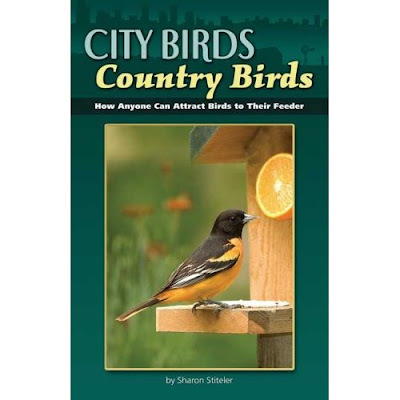 If you feed or house birds you should pick up a copy- I think it would be a great gift, too. 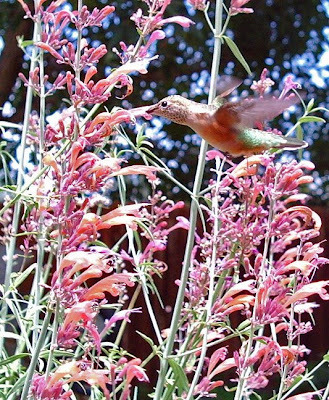 Don't you know someone, perhaps a casual bird watcher who feeds birds or has bird houses but would like to have more success? This is the book for them. 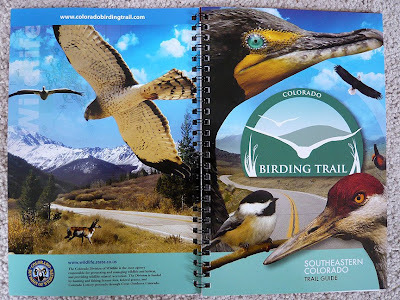 I also got some copies of the SE Colorado Birding Trail printed guides last week. Most of the bird pics in the guide are mine- cool to see this in print now in addition to being online. I'm not sure where these will be distributed but keep an eye out on the web page for updates. I also understand that part 2 (out of a planned 4) of the Colorado Birding Trail, the SW portion, is on the way. 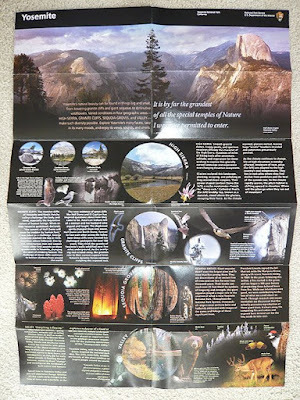 The other nice surprise that arrived in the mail recently was the new brochure for Yosemite National Park. It features a Black Swift photo of mine (just left of the center waterfall pic.) The NPS site says that Yosemite gets almost 4 million visitors a year- I'm guessing this is the widest audience so far for my photography!